Is the Width of Stance in Putting Immaterial? Your width of stance is a matter of preference. However, it is important that you stay balanced with a stance that helps to reduce any lower body movement. If you were asked for your opinion on how to set up your feet what would be your recommendation? Some pros putt with a wide stance reminiscent of a giraffe drinking at the water hole. Others adopt a narrow stance with their feet close together. The majority, however, putt with their feet shoulder-width apart. In deciding how to place you feet you could do no better than look to nature. Although nature didn't design us specifically to play golf, or to roll a ball along a flat surface, it gave us the ability to maintain our balance. Golf would be impossible if we kept falling over. The best width of stance for you is more than likely the one that gives you the best balance. After all why fight your natural instincts when there are so many other issues in putting? The frequent advice Be Comfortable needs to be qualified. Most of us have a habitual way of standing, such as always placing the weight of our body through one leg. However, in our putting stance we want a more even distribution of weight. At Full Attention soldiers stand with both heels touching each other and their toes pointed away at an angle of between 30- to 45-degrees. At Ease or Parade Rest they adopt a modified position of attention in which their left foot is moved laterally about 12 inches to shoulder-width. When you putt you need to be at ease. Placing your feet at shoulder-width as the military has done for hundreds of years make good sense. In putting, however, there is a catch when it comes to setting up your feet.. Probably an adjustment is a better word. You don't want your feet to angle outwards as they do in the full swing. To putt consistently you want to avoid any lower body movement. It is true that splaying your feet is a more athletic position and a better platform for balance. 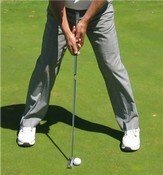 However, it introduces the possibility of your lower body rotating or swaying during your putting stroke. And this is undesirable. The setup for the feet is to have your toes pointing forwards. This locks in your lower body. Some pros take this locking-in technique further by pointing their toes slightly inwards. Putting is personal. As long as you consistently pick the right aimline (target line) and speed and can aim accurately, you will probably be a good putter. So why does having the correct width of stance important? The answer is that it all comes down to balance – being solid over the ball. Maintaining your balance is essential in all sports, and golf is no exception. To appreciate the importance of good balance and a solid base, try putting on one leg.